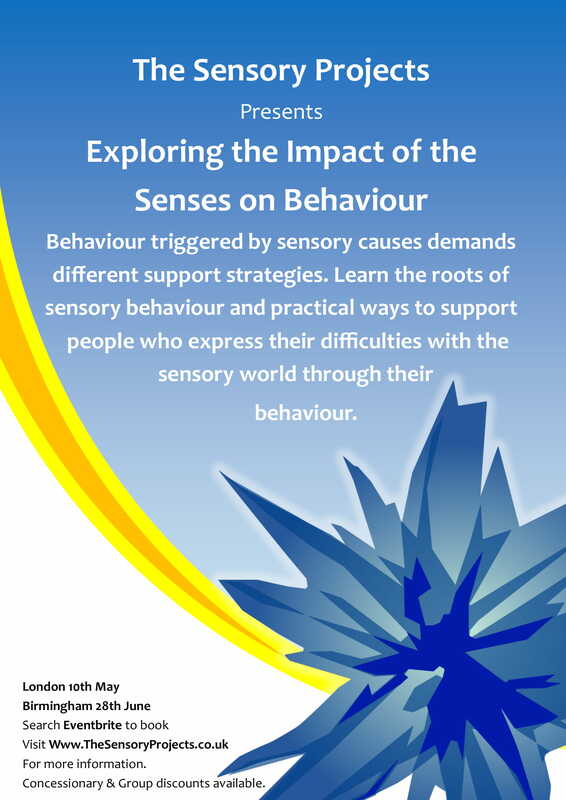 Explore the Impact the Senses have on Behaviour is a day that does what it says on the tin, and will equip you with strategies you can use to better support people who express their difficulties with the sensory world through their behaviour. Scroll down to read the full agenda for the day and see just how much exploring we can do! Welcome to a packed day all about the effect of the senses on behaviour, hosted by Joanna Grace of The Sensory Projects with guest speaker Katie Rose White from The Best Medicine. 9:00-9:30 Arrival from 9:00, ready for a 9:30 start. Enjoy tea, coffee, herbals or juice and a biscuit or two whilst browsing the bunting and resources in the room. 9:30 – 10:00 I am supporting a person who…. An introduction to The Sensory Projects, each other and the day ahead. A chance to talk about challenges currently being faced. 10:00 – 10:30 Behaviour: What’s the point? Identifying the purpose of a behaviour. Structure for support and wellbeing. Structuring our thinking about behaviour can enable us to provide better support and enhance our own wellbeing as we do so. 10:30 – 11:00 The connection between the sensory world and behaviour. Allowing the individual to be the authority on their experience. Introducing the multidimensional nature of difficulties with the sensory world. Recognising that behaviour stemming from sensory origins is about far more than a need for stimulation to be adjusted. 11:00-11:30 More tea, coffee, herbals, juice, biscuits and bunting. Explore resources, browse articles about the senses and behaviour, in our mini travelling library, ask questions. 11:30 - 12:00 Five routes to providing support. Examining these five interlocking aspects underpinning problems with the sensory world being expressed through behaviour and addressing individual and environmental approaches to each. Identifying those flying under the radar. Using the environment to support identification. Behaviour is a manifestation of brain function within a particular environment. Both the brain and the environment are malleable and may respond to interventions. 12:30- 1:00 Flight paths, communication strategies and a few myths and muddles. Creating a sensory flight path. Using sensory communication to support someone in a crisis state. Sensory Circuits and Multi Sensory Rooms as approaches to behaviour management. Consider how sensory presentation of the environment and yourself can help to de-escalate behaviour in a crisis situation. Understand the potential pitfalls of misusing Sensory Circuits and Multi Sensory Rooms as a means to support behaviour. 2:00 - 2:45 Externalising and habituating sensory support for self regulation. The different emotional regulation needs of people with neuro diverse conditions and people who have experienced trauma. Create sensory support resources and learn strategies to use them effectively. Search jars – Buffering emotional processing. Settle jars – Externalising emotional understanding. Gak/Slime – Focusing sensory attention. Understand why neurological differences necessitate a different approach to managing behaviour, including why typical behaviour management approaches cannot work with this population. 2:45 – 3:45 Teaching emotional regulation in the positive. Laughter: an innate, inclusive, accessible route to resilience. What happens to the brain when we laugh. Considering why we may want to teach emotional regulation skills in the positive, rather than in the negative. Guest speaker Katie Rose White from The Best Medicine will share the science behind therapeutic laughter and invite us to experience for ourselves how it can be used to support people in understanding how to emotionally regulate and in tackling anxiety. 3:45 – 4:15 Sensory strategies. Ways each sensory system can signal difficulties, be used to provide support, and possible sensory triggers. Changes to environment, communication, stimulation. Listen with all your senses to behaviour. A quick overview before we say goodbye.